Brightpearl doesn't have its own payroll module, so you will either be calculating wages, P.A.Y.E, N.I. etc manually, or you will be using a separate payroll system. However, you will still need to enter the figures into Brightpearl to ensure your accounting is correct. There are two steps to entering wages into Brightpearl, the first is to create the wages journals and the second is to record the payments from your bank account. If you've already paid your employees, or that's all you have time to do right now, then you'll need to enter the accounting later on to update your profit & loss accounts correctly. When entering journals, you can save them as a template to be used next time - you'd just need to update the values if they differ each month! This is done by entering an accounting journal at Accounting > Enter journal . You will need to debit gross wages expenses and credit your liabilities for P.A.Y.E, National Insurance, Net Wages and anything else as stated on your payroll report. Copy across the figures, ensuing that the total debits equal the total credits. You may need to include figures for pensions, student loan deductions, maternity/paternity leave, sickness and attachment of earnings. Add extra rows as required, but always ensure your debits and credit balance. You will need to transfer the money owed to your employees from your bank account. This also needs to be recorded in Brightpearl accounting. 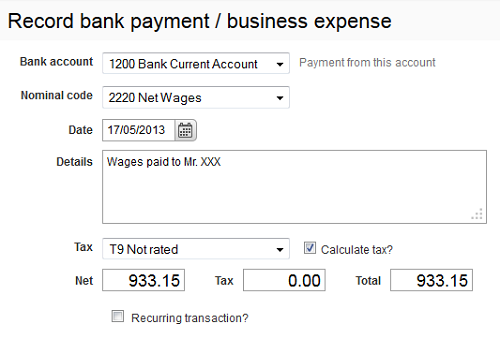 Create a bank payment at Accounting > Expenses/Bank payment to record the amount paid from your bank account for wages. You will need to record how much was withdrawn from your bank account to pay HMRC. This is entered either as a bank payment or a manual journal entry. You will need to record how much money should be accounted for relating to pensions via a manual journal; and then enter bank payments to HMRC and your pension company. Alternatively, if you are using third party Payroll software; you can just enter your wages journal into Brightpearl, and enter a Bank Payment to HMRC from your 7000 account code range if you wish. We would advise speaking to your Accountant to find out what best steps you should take for your business. If you're posting entries to nominal codes Accounts Receivable (1100) or Accounts Payable (2100) always enter a Contact ID to connect the entry it to a customer or supplier account. Go to Accounting > Bank payment . Select the bank account you want to make the payment from. Select the nominal code relevant for the expenses you are paying. Enter the details of the payment. This is for your own record, so that you know what the payment is should you need to investigate it later. Select the tax code and tick the check box to automatically calculate tax. Enter the amounts of the payment. If tax is applicable you can enter either the Net or Total and Brightpearl will calculate the tax for you. (Optional) Use the Department, Project and Lead Source fields to relate the payment for reporting purposes. Click the Enter bank payment button. The accounting journal is created immediately to update the selected nominal codes, the journal ID is displayed.